Rosine Mbakam left Cameroon at 27 to live in Belgium. Seven years later—having studied film and married a European—she returns, accompanied by her son. Motivated by a desire to better understand her past and the place she grew up, Rosine is nonetheless surprised by the revelations her mother and other women make in startlingly intimate conversations. THE TWO FACES OF A BAMILEKE WOMAN opens with Rosine making what she calls a journey into darkness—to the village of her birth, and later to the capital city of Yaoundé, where her mother now lives most of the year. 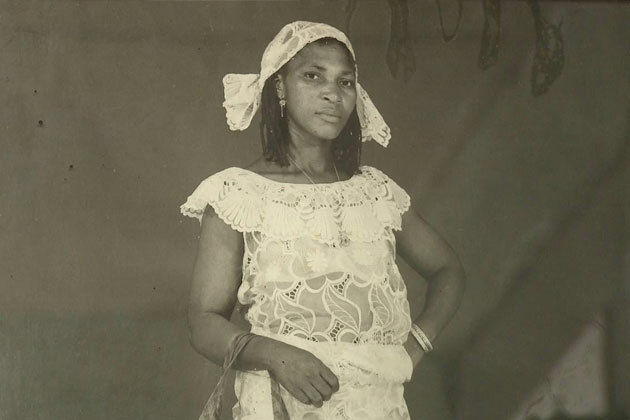 In the village of Tonga, her mother, Mâ Brêh, shares memories of the horrors of the war against French colonizers, and of daily life for a Cameroonian woman in an arranged marriage—a fate Rosine herself barely escaped, leaving the family of an angry ex-fiance behind. Rosine accompanies her mother, aunts, and other women while they go about daily tasks: cooking fish, serving kokistew to a crowd, and selling goods at a thriving market stall. Like many immigrants, she finds herself distant from her home country, yet drawn to its rituals and memories. She goes through a dusty suitcase of her late father’s documents, asks if she has damaged family traditions by marrying a white man, teaches her son to say “I love you grandma” in Bamikele, and asks her mother to do a traditional post-birth ritual several years after the fact. As she spends more time with her mother and the women around her, Rosine reveals the strength of their solidarity and their ability to face adversity—whether hiding for their lives from French soldiers or being committed to a man for marriage at age eight. This world of women’s work and women’s struggles is one that surrounded her in her early years, but she couldn’t recognize it—or its complexity—until she had been away from the social structures of her country. THE TWO FACES OF A BAMILEKE WOMAN is a sharply observed, nuanced and powerful feature documentary debut that captures the relationship between a woman and her mother—and subtly expresses the dislocation of emigration. The Poets follows two acclaimed West African poets, and lifelong friends, Syl Cheney-Coker and Niyi Osundare as they travel through their home countries of Sierra Leone and Nigeria to explore what has shaped their art.